Much is made over the subsidies that renewable energy have, almost always by their detractors. One would think, from listening only to the detractors, that no other energy source (electricity generation in this instance) has ever had, or ever will have, subsidies. The facts are quite the opposite. But, before getting into the actual numbers for each generating technology, a digression into subsidy policies. Also, what to include when the word subsidy is used. Governments are the usual source of subsidies, sometimes in the form of direct grants of money from tax revenues, or in favorable tax treatment (e.g. tax credits) to companies that engage in an activity, or regulations that favor that activity, or government services to that activity, or market activity i.e. the government purchases the product to ensure a market exists, also government guaranteed loans to build a project to produce the product. In the case of commercial nuclear power, an additional (perhaps unique) subsidy was granted: no liability to the nuclear plant owner in a catastrophic radiation release, beyond a small, nominal amount that is covered by insurance. The government assumes all liability above a stated amount. SLB has at least two articles on the Price-Anderson Act for liability subsidies for commercial nuclear power plants. Many, many activities are within the world of subsidies. Indeed, the US Federal Tax Code lists 21 items as tax credits for individuals, plus 31 additional items as tax deductions for individuals. The list for businesses is much, much longer. In addition to Federal tax credits and tax deductions, many states also have additional tax credits and tax deductions. Having looked at what subsidies are, next is discussed why they exist. Government has as a rightful concern the well-being of the people. There may be government policies that are to be adopted, but the government prefers that private enterprise conduct that activity. One example of this is commercial nuclear power. Before power plants were built, there were plenty of atomic bomb blasts, later nuclear blasts and hydrogen bomb tests. In short, those tests created great fear not only in the US population, but in many millions of people around the world. US President Eisenhower recognized this, and made his famous Atoms For Peace speech at the UN. In that speech, he advocated peaceful uses for the atom, including producing electricity in atomic power plants. The thinking was that maybe, people would be less frightened if they know of the benefits of atomic power. He also listed medical uses and agricultural uses. As a result, Eisenhower insisted the US utility industry build nuclear power plants. The executives were reluctant, knowing already that the cost to build such things was far greater than building a same-size coal-powered plant. They also refused to build any at all due to the huge liability and insurance costs from a radiation release. Eisenhower listened. And had Congress pass the Price-Anderson Act, to take on almost all the radiation release liability. So, that is one subsidy and its reason. Others, such as the tax deduction for home mortgages but not for home rental payments, are to encourage an activity that promotes domestic stability. The thinking is that a home owner takes greater pride in his home and is ultimately more stable than those who rent. There are arguments about that. Yet another is the direct use of government funds to build large dams across major rivers, store up the water in lakes and generate hydroelectric power as the water is released. Almost all of the large hydroelectric dams in the US were built with government money. Indeed, three of the biggest systems are the TVA, BPA, and of course the world-famous Hoover Dam. TVA is Tennessee Valley Authority, BPA is the Bonneville Power Administration. The power produced from all was sold at very low prices for many decades. Next, the question is, what is not a subsidy? Are there benefits that accrue to a technology that are not actually subsidies? That question generates considerable debate. One that is frequently thrown out is that fossil fuels do not pay for their external costs to society, which is claimed as a hidden subsidy. Another is that mining of oil, coal, and natural gas enjoys a mineral depletion allowance in the tax treatment of a company's revenues. Still others are the pollution to air, water, and soil from fossil fuels that create harm or monetary losses but are not paid for by the fossil fuel companies. Lately, the molecule Carbon Dioxide has been vilified as a convict (no longer a suspect!) in that category of pollution. The buzz-word today is "social cost of carbon." Examples include the mine tailings for coal, toxic metals in ash piles from coal, drilling mud from oil and natural gas, sulfur and nitrogen oxides from burning coal and oil and gas, particulate matter (PM) from fossil fuel combustion, and dirty water disposal from hydraulic fracturing operations. In addition, there are toxic salts from geothermal wells that produce power. Even more toxic are the radioactive solids left behind in the mining of uranium ores and its enrichment. Then, there are the impacts on wildlife. There were acid rain stories and scares a few decades ago that affected fish and the creatures that ate them. There are the millions of birds that are killed each year by conventional power plants. Yet, with all that as known pollution, the anti-wind groups focus solely on the bird and bat deaths by old-style derrick-design wind turbine support towers. Development," October 2011, By Management Information Services, Inc., Washington, D.C. The report results are summarized in Figure 1 below. UPDATE: 8/18/2017 - added the various elements for each category of subsidies in the Report. Added a number of Federal subsidy programs. Tax policy includes special exemptions, allowances, deductions, credits, etc., related to the federal tax code. Tax policy has been, by far, the most widely used form of incentive mechanism, accounting for $394 billion (47 percent) of all federal expenditures since 1950. The oil and gas industries,for example, receive percentage depletion and intangible drilling provisions as an incentive for exploration and development. Federal tax credits and deductions also have been utilized to encourage the use of renewable energy. This category encompasses federal mandates and government‐funded oversight of, or controls on,businesses employing a specified energy type. Federal regulations are an incentive in the sense that they can contribute to public confidence in, and acceptance of, facilities and devices employing a new or potentially hazardous technology. Federal regulations or mandates also can directly influence the price paid for a particular type of energy. 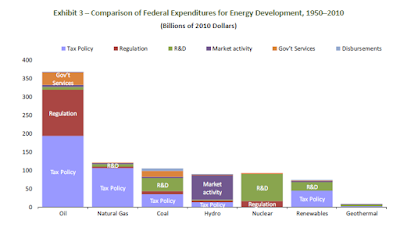 Thus, it is not surprising that federal mandates and regulations have been an important part of energy policy, accounting for $158 billion(19 percent) of energy incentives. For this analysis, two types of federal expenditures associated with regulation were identified: 1) gains realized by energy businesses when they are exempt from federal requirements that raise costs or limit prices, and 2) costs of federal regulation that are borne by the general budget and charged to the regulated industries. An example of the second type of regulatory incentive comes from the nuclear energy industry.Through the NRC (and its predecessor, the U.S. Atomic Energy Commission), the federal government regulates the design and operation of nuclear plants to ensure protection of public health and safety. In this case, an independent, credible federal regulatory regime promotes public and investor confidence in commercial nuclear enterprises around the country. The cost of regulating nuclear safety through the NRC/AEC through 2010 was more than $16 billion. This amount includes the cost of administering both agencies (AEC to 1975 and the NRC from 1975 forward) as well as credit for regulatory user fees paid by electric utilities. Since 1991, these user fees have offset most of the NRC’s operating budget. This type of incentive includes federal funding for research, development and demonstration programs.Of the $837 billion in total federal spending on energy since 1950, research and development funding comprised about 18 percent ($153 billion). This incentive includes direct federal government involvement in the marketplace. 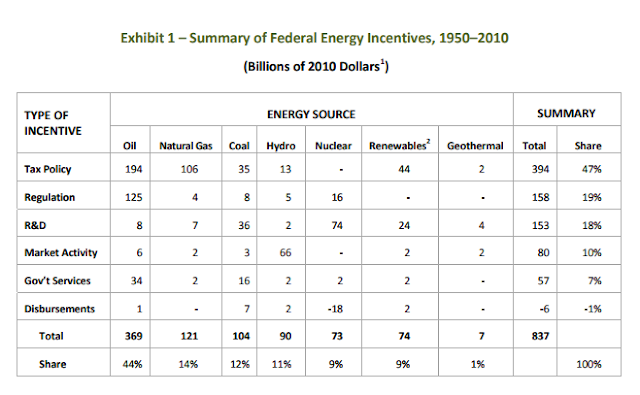 Through 2010,federal market activity totaled $80 billion (10 percent of all energy incentives). Most of this market activity was to the benefit of hydroelectric power and, to a much smaller extent, the oil industry.Market intervention incentives for hydroelectric energy include the prorated costs of federal construction and operation of dams and transmission facilities. These costs are prorated because beginning in the 1930s, federal dams and water resource projects have been multi‐purpose. The results of these investments include flood control, navigation, recreation, regional development and other benefits in addition to hydroelectric power. Therefore, it is necessary to estimate the portion of the net investment in construction and operation of dams allocated to power developmentand the relevant transmission facilities. Market activity incentives for the oil industry include the relevant planning, leasing, resource management and related activities of the U.S. Department of the Interior’s (DOI) Bureau of Land Management (BLM). This category refers to all services traditionally and historically provided by the federal government without direct charge and totaled $57 billion through 2010, representing 7 percent of total incentives. Relevant examples include the oil industry and the coal industry. U.S. government policy is to provide ports and inland waterways as free public highways. In ports that handle relatively large ships, the needs of oil tankers represent the primary reason for deepening channels. They are usually the deepest draft vessels that use the port and a larger than‐proportional amount of total dredging costs are allocable to them. The authors estimated the expenditures for federal navigation programs and allocated these costs as a petroleum subsidy according to the ratio of petroleum and petroleum‐based products carried to all water borne trade. Similarly, to estimate the incentives for coal production from federal expenditures for ports and waterways, the costs for all improvements were multiplied by coal's share of the tons of total waterborne commerce. This category involves direct financial subsidies such as grants. Since 1950, direct federal grants and subsidies have played a very small role in energy policy, accounting for –$6 billion, a negligible fraction of total incentives. An example of federal disbursements is subsidies for the construction and operating costs of oil tankers. For nuclear energy, federal disbursements are negative, meaning the industry pays more than it receives in disbursements as a result of the contributions the industry makes to the Nuclear Waste Fund. As of 2010, the Nuclear Waste Fund had accumulated an $18 billion surplus. The entry shown in Exhibits 1 and 2 for disbursements to nuclear energy is shown as a negative value to reflect the industry’s over payment compared to what has been disbursed on its behalf. End Update. 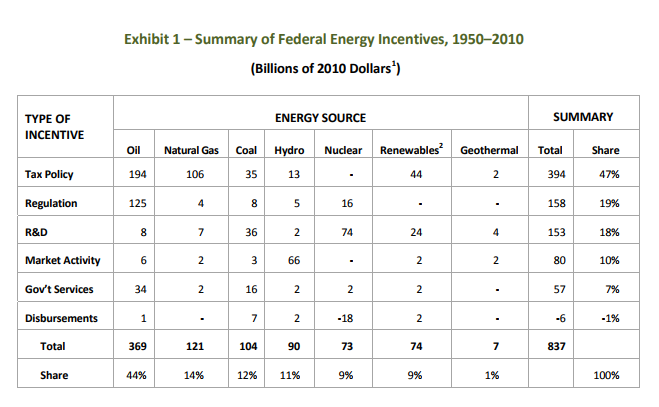 It can be seen from Figure 1 that subsidies exist for all in healthy amounts, except for geothermal. The number for nuclear incentives is mostly for research programs such as the fast breeder program. Notably absent for nuclear are the subsidies as described earlier, radiation release liability, loan guarantees, and others. The study is very interesting for a few reasons. It is very typical of nuclear-sponsored studies, as the industry strives mightily to deflect attention from its numerous drawbacks. In this report, nuclear power is compared to oil, gas, coal, hydroelectric, renewable energy (solar and wind), and geothermal. see Figure 2. However, it must be noted that oil is almost 99 percent used for purposes other than producing electricity. Some of those uses are transportation fuels, heating oil, petrochemical feedstock, lubricants, and asphalt. Natural gas also has many non-electricity uses, including things such as petrochemical feedstocks, fertilizer feedstock, heating uses, and transportation fuel. A small part of coal is used in making steel and cement, also non-electricity uses. But, this study includes all of the oil, all of the natural gas, and all of the coal for subsidy comparison. No wonder nuclear is not the largest number in their study. In fairness, however, the study does include non-electricity uses for nuclear power, such as for Navy, Army, spacecraft propulsion, and merchant ship power. Those are a very small amount. The second deception is the failure to include nuclear research funds into fusion. For whatever reason they saw as appropriate, nuclear fusion research is excluded. That, then, is a marvelous way to make the totals for nuclear subsidies appear smaller. -- end update 8/18/2017. One of the main arguments for incentives, or subsidies, is the research or assistance actually produces results that are useful. It is clear that most of the nuclear R&D has not produced useful results. In direct contrast, the funds spent on wind turbine energy have been extremely effective. Wind turbine generators have one-third the capital cost today compared to only 7 years ago, plus much better productivity or capacity factor. Also, wind energy now comprises almost 8 percent of of total US electricity production. That percentage will increase as more wind turbine generators are installed. Wind energy incentives, or subsidies, have been a rousing success. Nuclear research dollars, not so much. In fact, fusion is still 100 years away, breeder reactors are also, and molten salt reactors are a disaster waiting to be built.